From brackets to group guides that focus on teams connections to the Carolinas, our 2018 World Cup Hub is the place to go for all the latest local world cup information. Two ACL tears in less than a year would be difficult to come back from for most. But with hard work and a positive attitude, Charlottean Caroline Horne didn't just recover from her two ACL tears - she thrived. Learn more about how Caroline went from double injury to successful West Point student with the help of OrthoCarolina's medical team. Female athletes have been known to have a higher risk of injuring their anterior cruciate ligament, or ACL, while participating in competitive sports. McKaley Boston knows that pain all too well. This is her comeback story. I’m a mom of two active boys who love soccer. They’ve been playing since they were five years old. As a former athlete and a physical therapist, I know how important it is to give your body time to rest and recover from overuse of the muscles and joints. When my kids came to me and said they wanted to take a break this season, I understood. If you could increase your soccer skill level efficiency, drastically reduce your chance of injury, and help your body feel better before and after soccer, would you want to know how? Soccer is not only one of the fastest growing sports, but it’s also one of the most fast-paced. Like any contact sport there is always potential for injury, but during the juvenile and teenage years those chances are higher simply due to growth patterns and growing bodies. Jennifer DeRosa knows all too well about soccer injuries. Jennifer started playing soccer at four years old and battled through injuries from a young age through college, playing Division 1 Soccer at UNC Asheville. Injuries included knee and neck strains, and she even needed anterior compartment surgery to bilateral lower legs. Prevention of injuries is key for all ages and all sports. These days, most people usually agree that athletes should be doing some type of warm up prior to taking the field, including sports like soccer. What is less clear is exactly what that warm up should look like. Just jogging or doing prolonged hold, stretching is inadequate, and may actually do more harm than good. We’re partnering with local sports medicine giant OrthoCarolina to bring you even more locally-brewed goodness here at Soccer ‘n’ Sweet Tea. Not too long ago I was working with the U.S. Men’s National Beach Soccer team in their Beach World Cup qualifier tournament. OrthoCarolina is committed to supporting our local community. 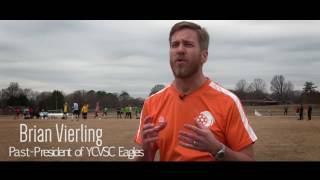 Here are some highlights of a partnership in Hickory we have with the YCVSC Eagles. CSA and OC Player of the Month Charlotte Soccer Academy and OrthoCarolina have partnered to present the Charlotte Soccer Academy Player of the Month Award. Each month, we will recognize an outstanding player. Andy Hylton, OrthoCarolina physician assistant and former professional soccer player says direct blows to the eyes generally result in temporary blurry vision and can result in a "black eye", but occasionally a more serious eye injury can occur. However, despite the love for soccer, the majority of players in England, still played multiple sports. Charlotte Soccer Academy and OrthoCarolina have partnered to present the Charlotte Soccer Academy Player of the Month Award. Each month, we will recognize an outstanding player. Injuries to the face are common in soccer, most often occurring though direct impact with either a soccer ball or collision between players. The pain of shin splits can sideline your game. Soccer players combine speed, strength and agility to compete on the field. Ball handling, sprint work and shooting drills are typically incorporated into practices… but developing core strength may not be. What’s the best way to ice a soccer injury? If you’ve played or watched soccer, you know how physical the game can be. Committed to keeping you in the game and proud to support numerous area youth soccer clubs. What advice would have been helpful to me as I played over the years?